Shoes can add more than a touch of pizzazz to an outfit. 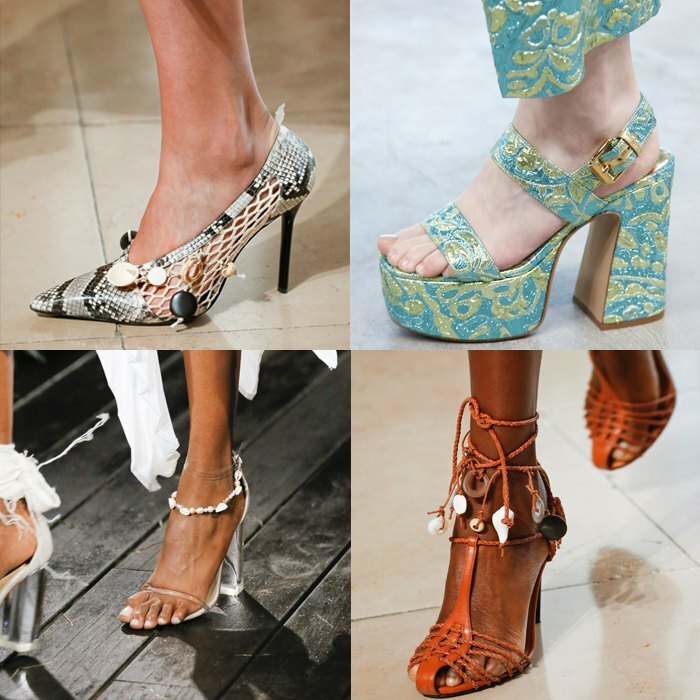 But do you know which shoes are on trend for spring? 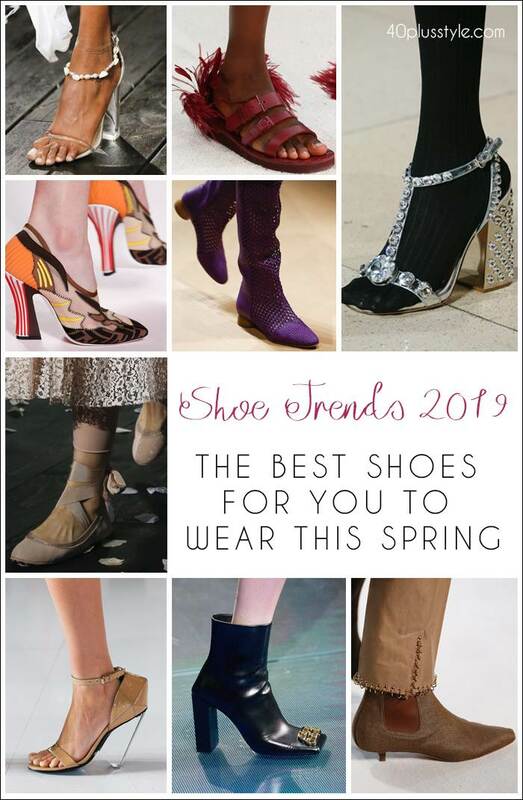 Here are the best shoe trends for 2019 that you may want to add to your style this year. I always think that shoes, perhaps more than anything, can make an outfit truly stand out. Just think about an all navy outfit where you add orange heels, or a casual outfit of jeans and a t-shirt, where you add a pair of silver sneakers. Shoes can make a real difference. But, it’s usually necessary to think not just about what is on trend but also about how a pair of shoes will work with what you already have in your closet, and with your lifestyle. After all, no one wants to be tottering around doing errands in a pair of four-inch heels. While I’d never advocate simply following the shoe trends just because they are trendy, I always think it’s a good idea to take note of the trends and then think about whether you already have some of them in your closet, or whether you could adapt them to your own style and lifestyle. Could you, for example, use a similar color or pattern of shoes as those of a designer you love, but opt for a flat rather than a heel? Although we will focus on trends (and plenty of rather outrageous shoes) in this article, we will go back to more common shoes in further articles. You may already want to check our list of arch support shoes. Here are the best trends from the spring and summer runways for women over 40. Square-toed shoes weren’t a big no-no, but nor were they particularly on my radar until this year. Square toes last had a moment in the early 2000s, but they looked more futuristic this time around, with many designers opting to showcase them in white. Okay, I’m not sure how many feathers I would wear as I don’t want to end up looking like Big Bird on Sesame Street. But, I think some subtle feather embellishment could definitely be very stylish. My feeling is that feathers work best on heels for a night out or an event. Otherwise, I can see that I’d end up with feathers trailing along the ground which simply ended up getting dirty. Simone Rocha’s look, for example, was just totally impractical for everyday life. But, if you can find flats where the feathers are placed strategically to keep them away from the floor, they could work too. Or, maybe rather than feathers themselves, you could work the trend by looking out for a pair of shoes which have a feather print. Every season, there’s always something of a micro-trend. And, this season, it seems to be the turn of seaside-inspired shoes. Footwear was adorned with everything from shells to starfish motifs to colors inspired by the ocean. 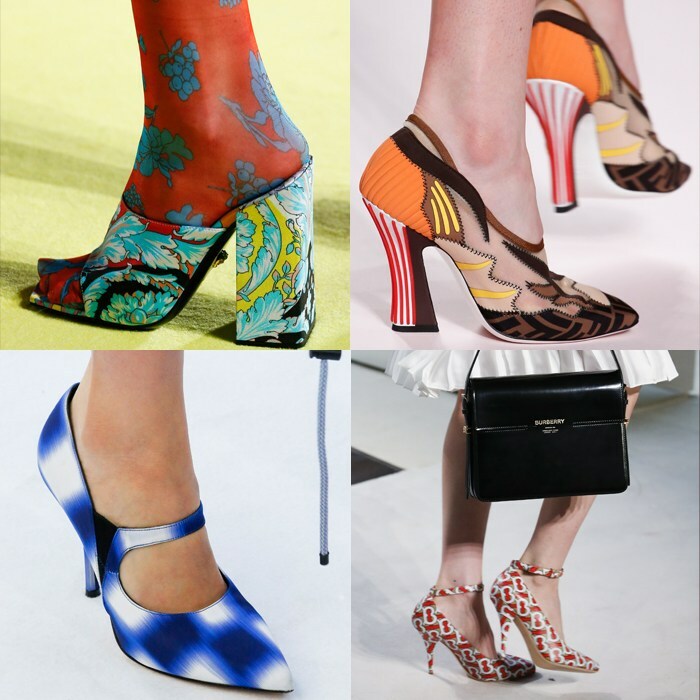 Talking of prints, those on show for shoes this season was one of the big strengths of the runway shows for SS19. I love printed shoes and shoes with a bit of color. They can turn a simple black and white outfit into something special. 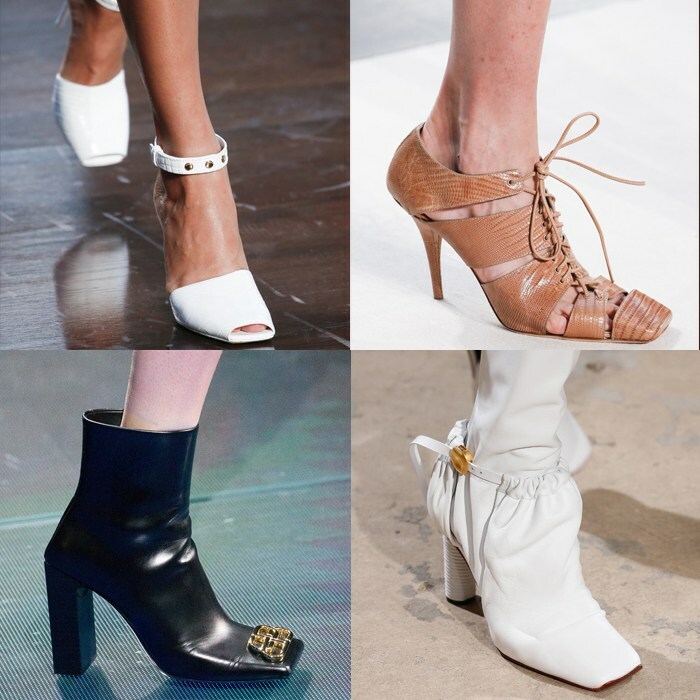 Although these are all heeled shoes, you will also be able to find these in flat options this season. For Fall 2018, lots of designers decided to opt for hot pink footwear. But, for summer, it seems a sunshine shade is more in order. 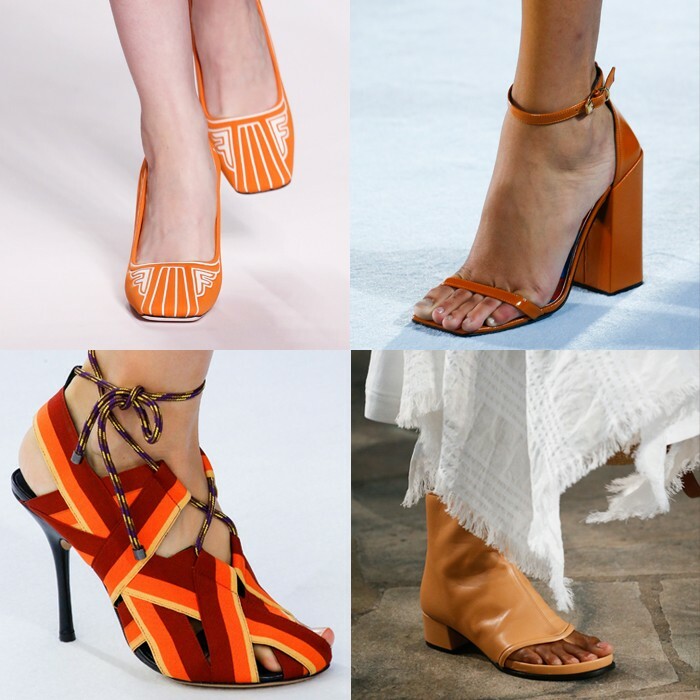 Orange was a big color trend when it came to shoes and would go beautifully with so many other colors for spring and summer, including neutrals like navy and white, and colors such as purple or green. 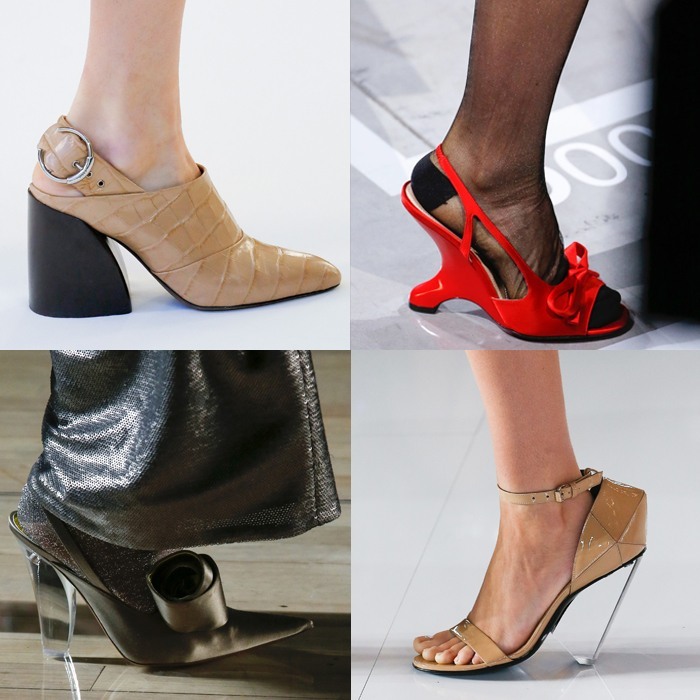 While heeled shoes can sometimes be tricky to walk in, particularly if they have a very narrow point, many designers decided to make it easier this season by having the heel narrower at the top and wider at the bottom. Others opted for a very sculptural heel or one which was see-thru, giving the impression of walking on air. 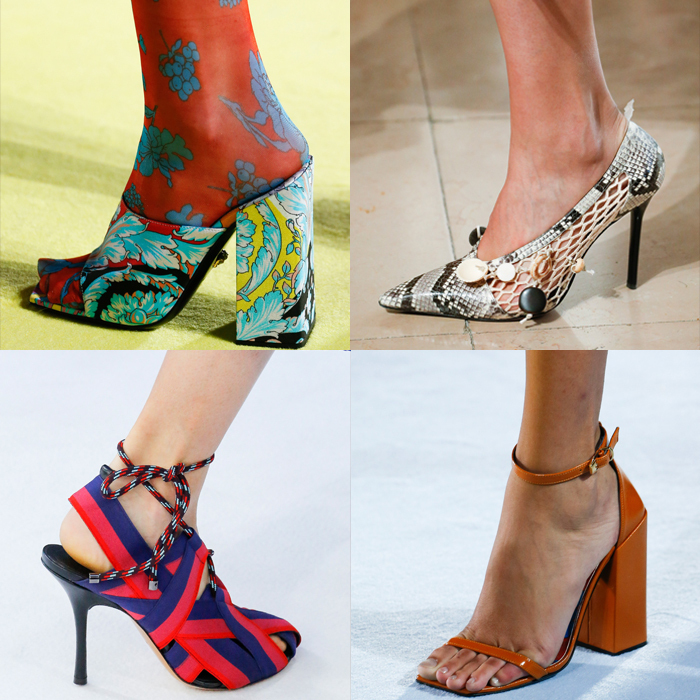 Kitten heels are more on trend than skyscraper high heels at the moment, which is good news for your feet! But, there is the possibility they can look matronly. I would make sure to pick a pair in a vibrant color or a shoe boot instead of a shoe. If you love embellishment on your shoes, then this season, it has to be crystal. Opting for crystals could be a great way to add some extra bling for a summer event. The pearl detailing seen on the catwalks was also beautiful. Or you could simply look for either heels or a pair of casual shoes in a metallic shade. 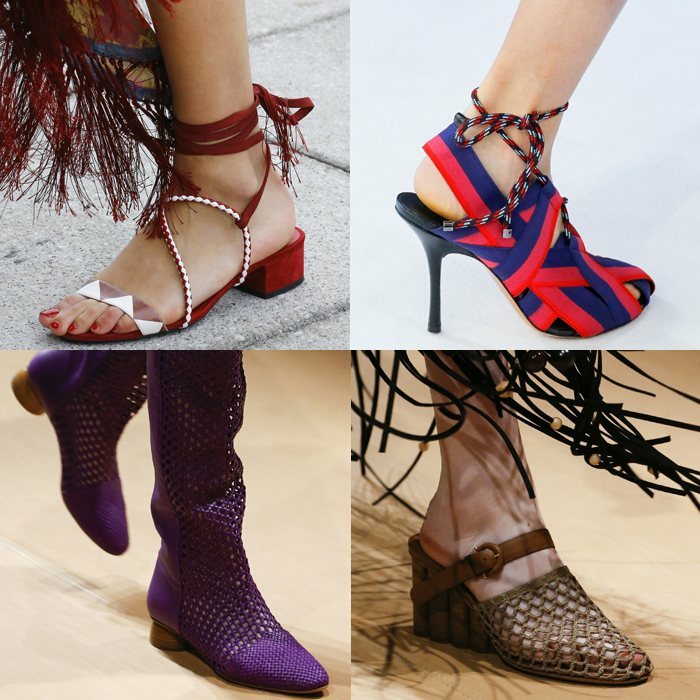 A trend that seems particularly on point for summer, given that it has vibes of fishing, boats and the seaside was shoes and boots featuring rope details and fishnet. The fishnet boots from Salvatore Ferragamo looked beautiful, but I’m not sure they were very practical, as you couldn’t wear them with socks! Ballet pumps and skinny jeans were particularly on trend during the early 2000s, thanks to supermodel Kate Moss and the late Amy Winehouse. Two designers in particular – Dior and Off White – were once again inspired by the ballet details. Thankfully, you don’t have to go on pointe – most of the shoes on the runways actually looked comfortable. Plus, if you choose a pair in a shade close to your skintone or to the pants you are wearing, this could have the effect of making your legs look longer. 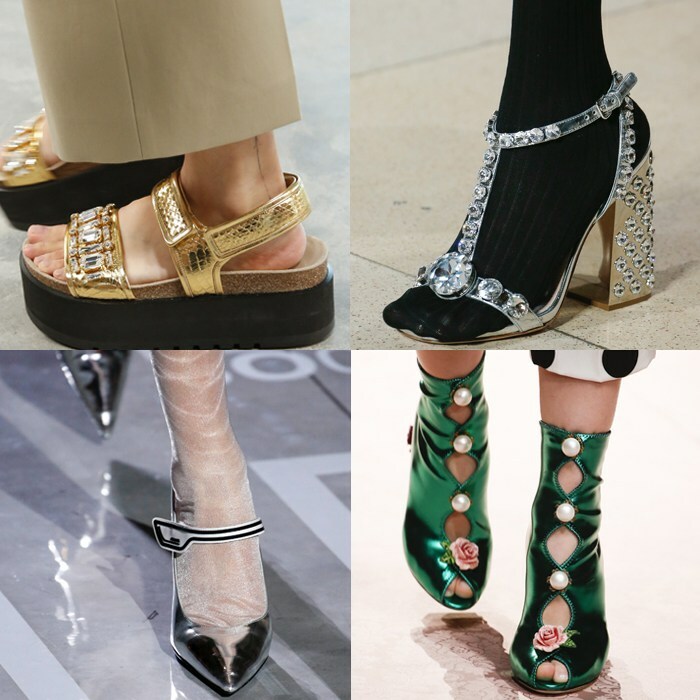 There were a lot of toe-post heeled sandals on the catwalk for spring 2019. And, I have to say, some of them looked rather painful and uncomfortable; as if the toe post was in the wrong place to actually fit your toes. However, there were others that you could see could work like these striped shoes at Dries Van Noten and the flip flops by Chloe (although the model’s feet were obviously too big for the size available!). 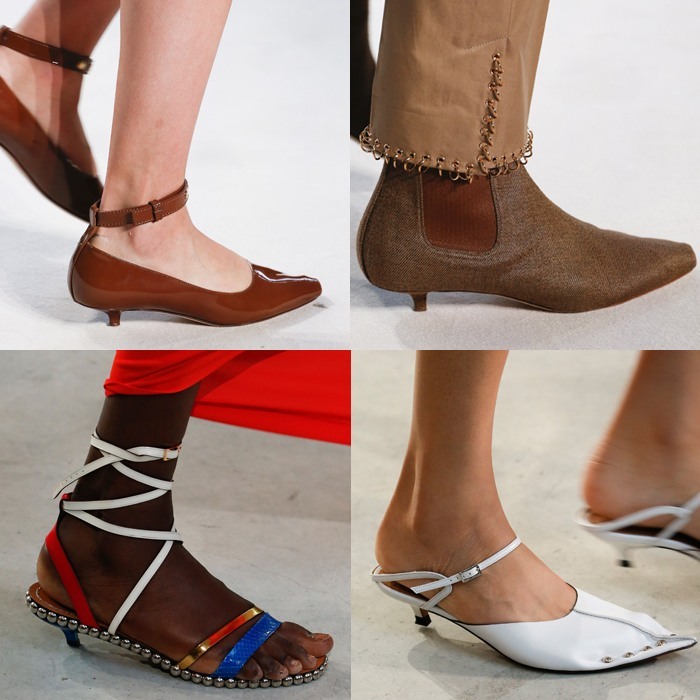 Most of us don’t like to wear heels everyday, and there were plenty of flats on show on the runways for SS19. Some looked more supportive than others, while those with a very flat heel might be uncomfortable after a while if you have high arches. 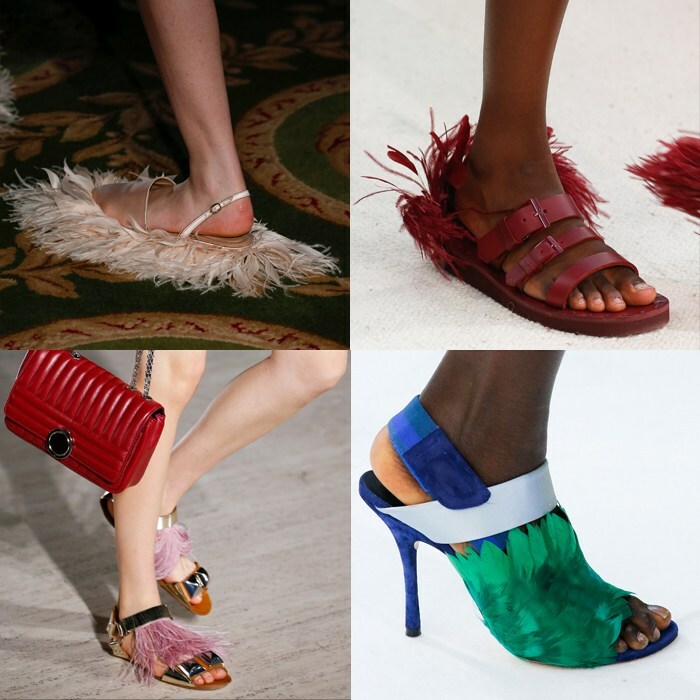 Which of the shoe trends 2019 do you like best? Which would you most like to have in your closet? Toe posts are my favs mentioned, although statement fabrics are a close second! I had a pair of square toe /square heel high heel slingbacks in the 1990s. They were super comfortable, but did not do my size 10 feet any favors. I did manage to wear them out though, so I guess I liked them ok. Think tall socks would work fine in the Ferragamo boots – like the knee high compression socks in bright colors that runners wear. Ouch, the toe strap photo with the band-aid hurts to see. And the two obviously too-short sandals. Since models are so tall, they are likely to have larger feet as well. I often find I need to order up 1/2 to 1 size in backless shoes, especially flat sandals to avoid the awful heel hangovers. My pick from the whole bunch are the printed Fendi pumps with the striped heel. Wow! Not that they’ll be on my shopping list $$$. I’ve a pair of black and white polka dot high heel pumps on the way, as a Valentine from my husband.